Have you ever walked into a situation that was so gross you just kind of stood frozen in your tracks? I mean, something so unthinkable, that after you snap back to reality, you make a beeline for your phone so that you can snap a picture?! If not, then I’m going to assume that you live in the land of giggles and gumdrops and lollipop fields! If you live in the world I live in, then you see stuff all the time that’ll make you scratch your head and render you speechless. It’s happened to me twice lately, and yes I do have the pics to prove it! What I’m about to show you is real. I haven’t doctored, or filtered anything. There are no names, or faces associated with either of these situations, so I think I can post these pics guilt free. If not, that’s between me and God! And now I present to y’all – Things That Made Me Shudder, And Throw Up A Little In The Back Of My Mouth, Yet I STILL Took A Picture! See what I’m talking about?! Was I exaggerating?! The commode was obviously at a restaurant. I hopped out of the car while Steve went through the drive-through. I didn’t take my purse or phone, which is unusual for me, but you’d better believe that when I opened that door, after I had stood there with my mouth agape for a minute, I ran to the car, flung open the door, and ran back to the bathroom to take the picture. When I got back to the car Steve was like “What was that all about?” When I showed him the picture he just looked at me like I can’t believe you went back to take a picture of that! But believe me….I did! 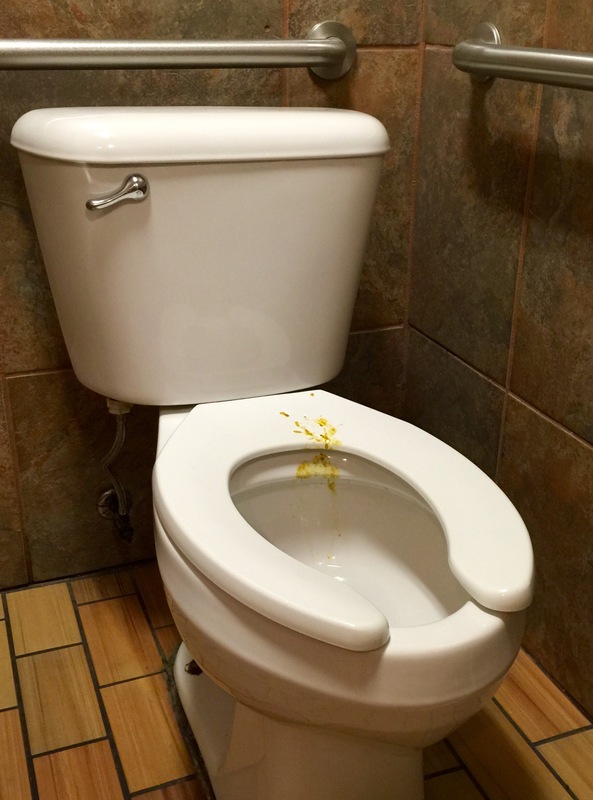 First off, the poor individual who pooped in that toilet knew they’d left their mark, because they flushed! They turned around, reached for the handle, and flushed! Why, on God’s green earth, wouldn’t they have taken the time to wipe their diarrhea off the toilet?! WHY?! If they were wearing a long shirt, chances are they had poop on their shirttail. If they had poop on their shirttail then clearly they soiled the set of the car they got in when they left! Ew! I hope they had leather seats. Things that make you go ew??!! What in the world would make someone take pictures of things that are clearly not pleasant to look upon? Well, for me? I’m always looking for “interesting” blog material! But as always, I got to thinking about Jesus! There’s a big difference in how we look at situations and how He looks at situations. We look at people, and things that seem gross, and we turn up our noses and/or take pictures to use as bad examples in good blogs! But God……God looks at gross situations, and gross people and He sees opportunities! He sees a chance to clean things up and use them as good examples! He goes before us and behind us and cleans up the messes we make. He sees us in vulnerable situations and He covers us with grace and mercy. Thank You Lord for the material! And I also thank You that you’re not like me! I’m so thankful that You’re not on Facebook, Twitter, or that You don’t blog about the crazy things Your children do! If You’d snapped a pic of every stupid thing I’d done (and will do),You’d be writing, updating your status, and tweeting a lot about me! You’re such a good and loving God! Posted in Daily devotional.Tagged embarrassing, humor, Inspirational. Previous Post I Swear! I AM A Virgin! Next Post Give Credit Where Credit Is Due!